In 1824, McClellan and others petitioned Jefferson College at Canonsburg to add a medical College. While technically part of Jefferson College, Jefferson Medical College was located in Philadelphia with administrative and financial responsibility in the hands of the faculty. Although challenged by the University of Pennsylvania, in 1826 the Pennsylvania Legislature passed a bill that ratified the actions of Jefferson College. 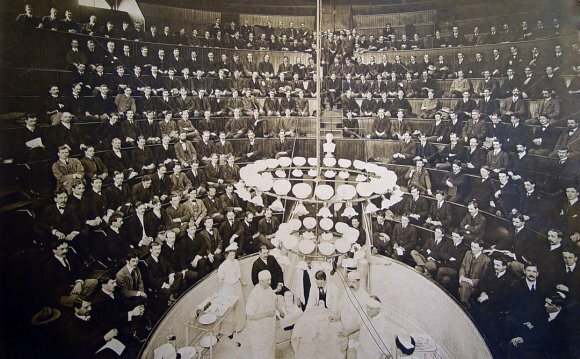 This allowed the College to grant medical degrees — graduating students with experience in supervised participation in the care of patients, a revolutionary approach to medical education at the time. With the growth of Jefferson Medical College, the College constructed the Ely Building in 1828 – complete with a lecture hall in the lower floor and the “Pit”, a 700-seat amphitheater to allow students to view surgeries. Jefferson’s first free-standing hospital and the second hospital in the nation connected to a medical College, admitted 441 inpatients and treated 4, 659 outpatients during its first year of operation. At mid-century the medical college boasted notable Jefferson alumni and strong college faculty. Professors of the 1841 "famous faculty" included Robley Dunglison (Institutes of Medicine), John K. Mitchell (Practice of Medicine), Joseph Pancoast (Anatomy), Thomas D. Mütter (Practice of Surgery), Charles D. Meigs (Obstetrics), Franklin Bache (Chemistry) and Robert Huston (Materia Medica). In 1856, a renowned graduate, Samuel D. Gross, MD (class of 1828), returned to bestow upon his alma mater a reputation that has lasted to this day. Dr. Gross was pre-eminent in the medical profession. The finest surgeon of his time, an educator of the highest distinction, and author of 14 books, Dr. Gross (immortalized in artist Thomas Eakins' "The Gross Clinic") considered himself to be first and foremost a physician who devoted much time to family practice. The Eakins Gallery was inaugurated in 1982 to celebrate the university's portraits of three eminent Jefferson Medical College professors painted by Thomas Eakins — Drs. Samuel Gross (The Gross Clinic), Benjamin H. Rand and William S. Forbes. The Gross Clinic was sold to the Philadelphia Museum of Art and Pennsylvania Academy of Fine Arts in January 2007. The Rand and Forbes portraits were sold in April and June 2007, respectively. Reproductions of all three portraits now hang in the gallery. In 1891, Jefferson created Jefferson Hospital Training College for Nurses. Now known as Jefferson College of Nursing, it offers a continuum of fully-accredited nursing degree programs, from baccalaureate through doctoral levels. By 1949, Jefferson Medical College included advanced degrees in anatomy, bacteriology, immunology, etc. in its curriculum. The formation of the College of Allied Health Sciences in 1967 began a move toward the integration of other health professions into the Jefferson curriculum. Now known as the Jefferson College of Health Professions (JCHP), it is comprised of six health professions programs – Bioscience Technologies, Couple & Family Therapy, Occupational Therapy, Physical Therapy, Physician Assistant Studies, and Radiologic Sciences – and the Professional & Continuing Studies department, which offers general education courses, including associate and bachelor degree programs. JSHP students earn degrees ranging from Bachelor of Science through clinical doctorate. The Jefferson College of Biomedical Sciences (JCBS) offers courses and programs across a wide field of basic and translational biomedical sciences leading to the PhD degree, the MS degree, and to graduate certificate programs. The Jefferson College of Pharmacy was founded in 2008. It has an innovative curriculum that effectively advances health through teaching, research and service. Its Doctor of Pharmacy program is accredited by the Accreditation Council for Pharmaceutical Education.